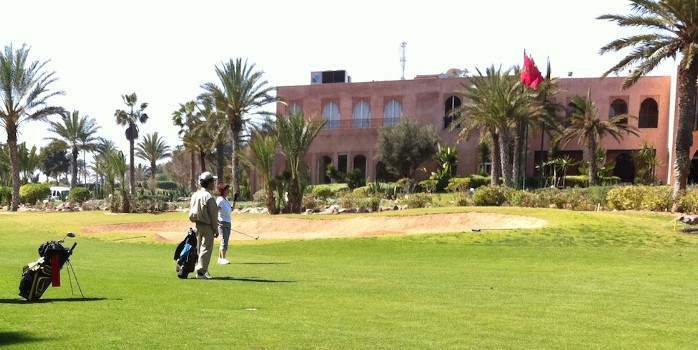 An Agadir golf holiday can easily be combined with time in Marrakech. 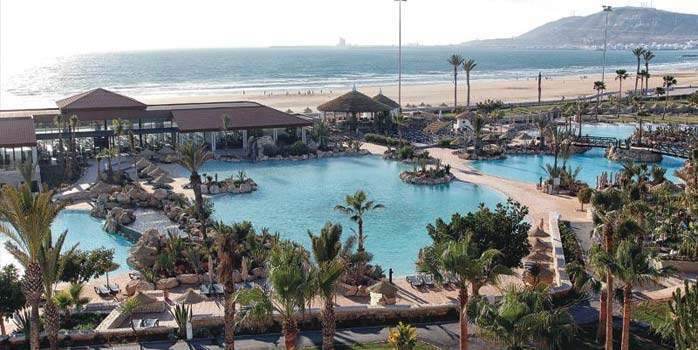 Agadir is sited on a gentle bay with seven miles of magnificent sandy beaches. It is the country’s leading fishing harbour and a lively ancient town founded by the Romans and watched over by its citadel, built by the Portuguese in 1540. 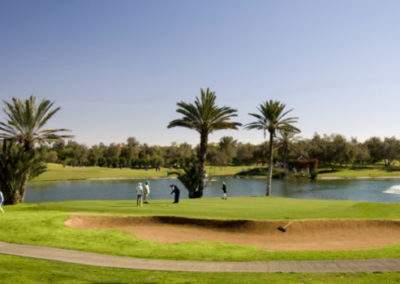 Agadir is a prime golf destination with two excellent golf facilities, each with 27-holes: Les Dunes and the Golf du Soleil. But in 1960, shortly after the independence of the country, disaster struck and the city was virtually destroyed by two earthquakes and a tidal wave. In the aftermath of the disaster, the government undertook the reconstruction of Agadir and planed the area as Morocco’s major tourist resort. The city was rebuilt according to modern specifications for this purpose and today Agadir is indeed Morocco’s foremost seaside resort and offers a wide range of five and four star hotels On the southern Atlantic coast of Morocco, Agadir offers two superb courses to the avid golfer in search of prime golf facility and good playing conditions year round, with mild winters and pleasant summers thanks to the ocean breeze. Golf les Dunes, MoroccoThe magnificent Golf Les Dunes was laid out on a superb stretch of land amidst the dunes of the Atlantic, hence its name, although the ocean is nowhere to be seen on this wooded course. Instead, abundant growth of eucalyptus are punctuated by vast expanses of water. 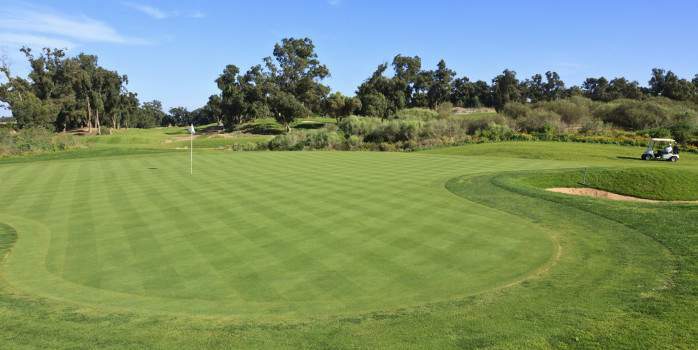 Cabell B. Robinson, a disciple of Robert Trent Jones Senior, used the terrain to perfection, retaining stands of majestic eucalyptus tress, both as an aesthetically backdrop and for strategy. It is a glorious site and the architect has done justice to it. 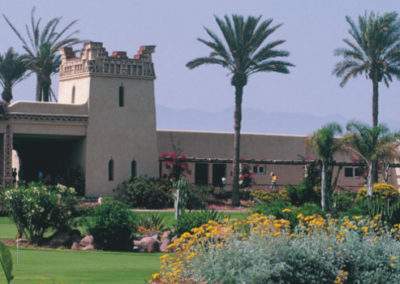 Robinson has incorporated a number of remarkable surprises and technical challenges into the three nine holes, Par-36 courses: the Blue, Red and Yellow. Depending on one’s ability, the three nines can be combined for a demanding challenge or for a beginner friendly round. Excellent practice and teaching facilities, as well as a pleasant clubhouse with a large terrace overlooking the driving range, nicely complements this superb facility. 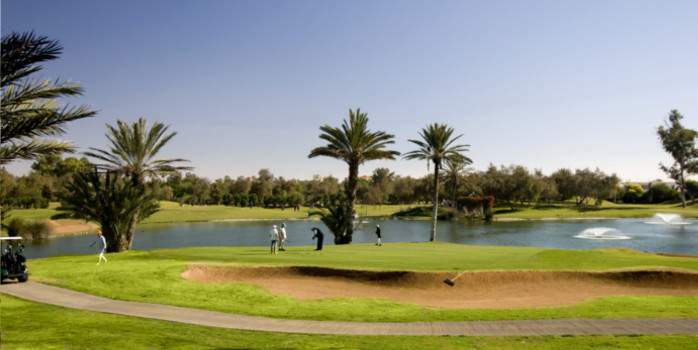 Golf du Soleil Fascinated by Morocco’s Atlantic coast scenery, architect Fernando Muella gave full rein to his imagination and shaped an exceptional piece of golf extending over 200 acres of wooded terrain dotted with lakes and cascades. The three loops of nine holes each offers a different challenge and can be played in any combination, offering a welcomed variety of rounds. Each one of the three nines starts and finishes next to the clubhouse. Golf du Soleil was designed to challenge technically accomplished players while giving beginners a fair chance to record a good score. As usual in Morocco, caddies are mandatory, which is a good policy as it greatly helps first time players on the course. Extensive practice and tuition facilities include the Sun Academy, a state-of-the-art school offering a range of programs and facilities for all level of play, from complete beginners to low handicappers. The large and lavish clubhouse enjoys a splendid location overlooking Golf du Soleil’s major lake and its cascade. The clubhouse has a large conference room, lounges, bridge room, bar and restaurant serving lunch until late in the afternoon, best appreciated on the panoramic terrace overlooking the lakeside finishing holes of the Red and Blue nines. 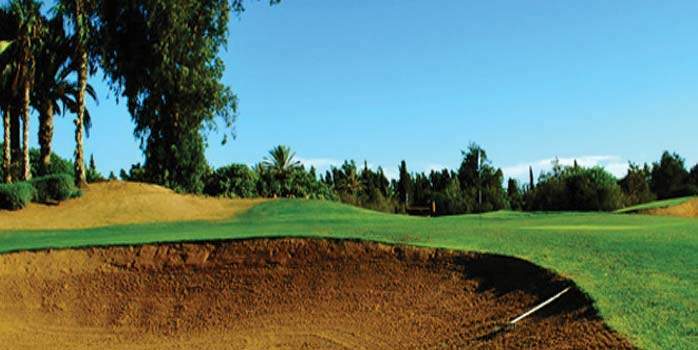 The course is situated 15 minutes from the Atlantic Palace Hotel, close to the Bensergao Forest, in the same area as Agadir’s other golf courses. 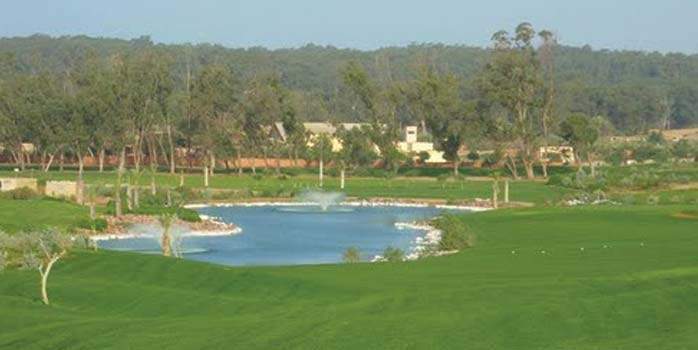 The 27-hole course, designed by Collins Belt, extends over 100 hectares of lush fairways and greens, boarded by eucalyptus trees alongside the river Souss. The 250 metres long driving range can accommodate 80 players. 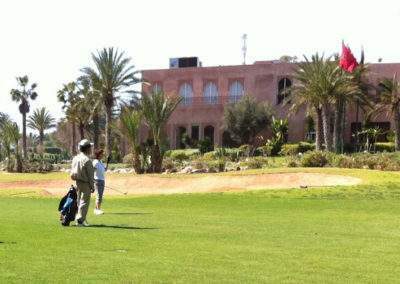 The Soleil Golf Course is set in-between the Atlantic Ocean and the Atlas Mountains. It appeals with a rare combination of game and sensations. It spreads over 85 hectares planted with tamarisk, mimosas, Eucalyptus and palm trees. 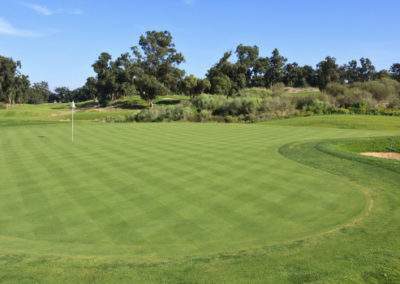 The greens are well guarded by bunkers, and 4 lakes bring water in play on 6 holes. It will suit all levels of play. Opened in: 2000 – Designed by: Fernando Muella & Gerard Courbin. 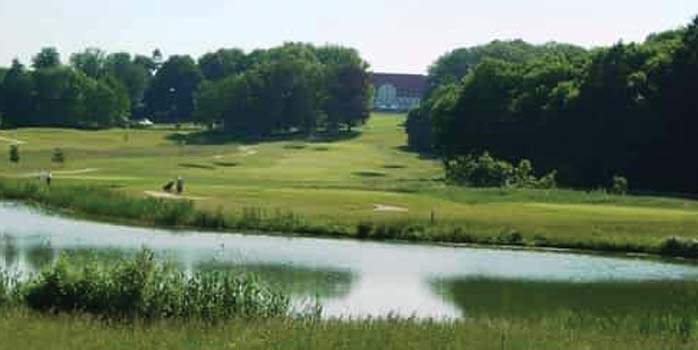 Ten minutes drive from the town centre is the Golf Les Dunes, beautifully landscaped to international standards by architect Cabell Robinson covering 107 hectares: 3 courses 9 holes, par 36. With a huge driving range in front of the club house, a putting green, a pitching green with bunker practice, a pro-shop, a club house with catering services and a large terrace overlooking the practice area. 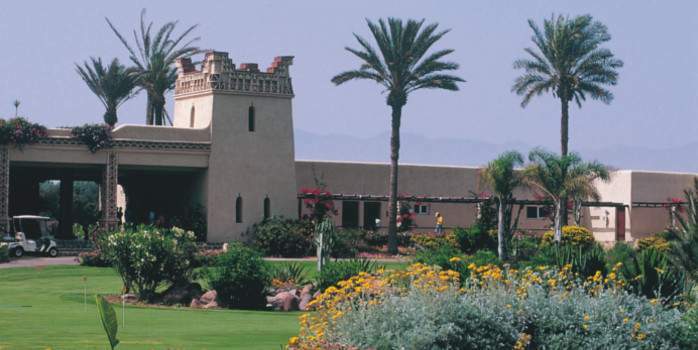 The blue course features large fairways among eucalyptus – The red course features beautiful lakes surrounded by Tamarisk – The yellow course is technical with a large lake on tee No 9. The 4-star Riu Tikida Dunas Hotel is a perfect place for a golfing holiday in year round sunshine.